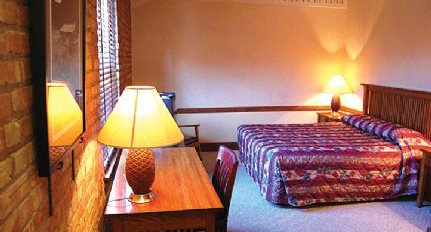 TWO NIGHTS on the western edge of Glacier NP, experience genuine Montana hospitality with your stay in this 1910 National Historic Landmark Railway hotel. Check in to a small, basic room with one double bed and a balcony with incredible views. In the evening, order up a couple of cold local micro-brews from the Tap Room and decide if you just want to have a Montana size appetizer or sit down for some of the finest dining in the Flathead Valley at The Grill Dining Room. Continental breakfast provided. located in northeastern Glacier NP on the shores of Swiftcurrent Lake. This chalet inspired National Historic Landmark Hotel boasts breath-taking alpine beauty and Swiss themed architecture and decor. Stay in a small rustic lakeside room, offering two double beds, private bath, modest amenities, and old-world style (limited lake views). 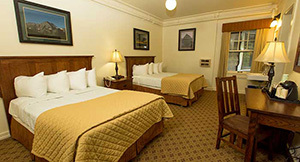 The hotel also offers a fine dining restaurant, lounge, apres fondue, gift shop, and snack shop. Enjoy photographing the famous, panoramic views of Grinnell Point and Mt. 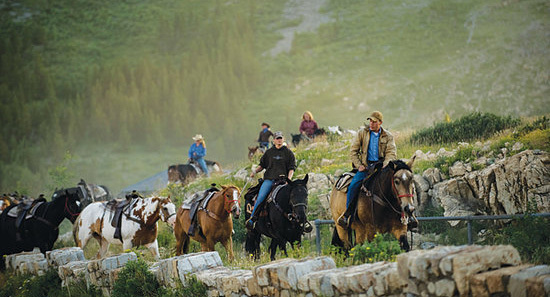 Henkel and spotting mountain goats, big horn sheep, and bears. at a beautiful, modern log lodge perched on a hillside with vast vistas of Flathead Lake, near the quaint village of Bigfork, MT just south of Glacier NP. 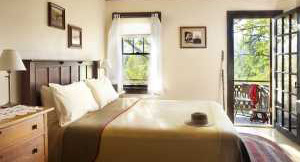 We will reserve a tastefully decorated suite featuring a king bed, living room with a queen sized sofa sleeper, gas fireplace, wet bar and shared deck. Upper level suites with lake views available at additional costs. Your resort features exceptional dining onsite, heated pool, hot tub, art gallery and espresso bar. Nearby Bigfork has art galleries, fine dining, theatre, and endless outdoor activities. 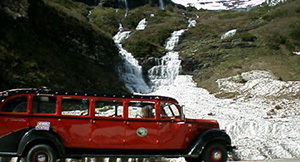 gives you the opportunity to fully immerse yourself in the spectacular beauty of Glacier National Park and the Middle Fork of the Flathead River. Aboard this 2-3 hour trip a guide will share interpretive info and history of the area while escorting you down one of the most pristine watersheds in the world. Wildlife abounds on this stretch; you may see eagles, osprey, and maybe even an elusive bear or moose! 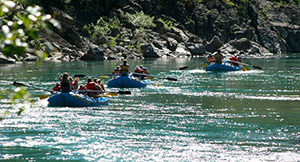 Scenic floats are ideal for those looking for a restful, rejuvenating river experience. They’re also a great option for families with small children or individuals looking for a trip that doesn’t require much physical effort. Some paddling is necessary, but these floats are anything but strenuous.